You go to great lengths to bring your product or service visions to life—from brainstorming to evaluating ideas, scoping out the competition, developing a prototype, making necessary changes and improvements, and, of course, the big launch. Even after all of that, however, you may find your sales numbers just aren’t cutting it. So, how can you change that? With the help of affiliate marketing, of course. You may not be sold on the idea of it just yet. But, trust me when I tell you that this source of generating passive income is growing in popularity. And, you need to jump on the bandwagon ASAP! Though, to win at affiliate marketing, you must take care of your affiliates—from start to finish—by providing them with the resources they need to support their promotion efforts. Simply put, the easier you make it for them, the easier it’ll be for them to market your product or service to their audience. At long last, you’ll finally be on your way to grabbing hold of those sales numbers you’ve been dreaming about. So, what do I mean by resources? Well, today, I’m only focusing on swipe copy. 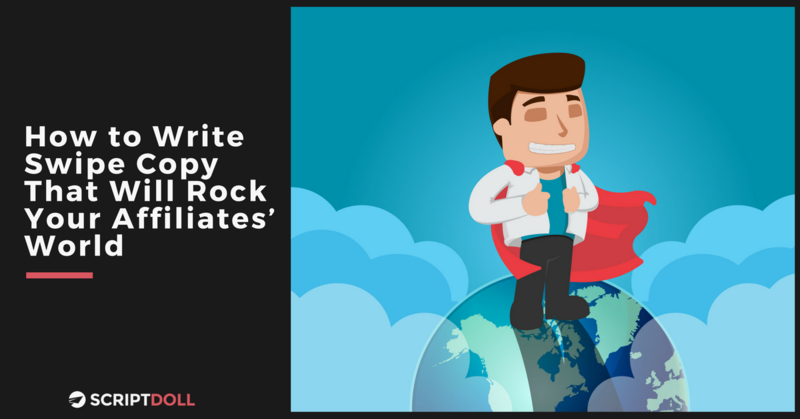 And, helping you understand how to write it in a way that will rock not only the world of your business, but also your affiliates. What exactly is swipe copy? Swipe copy is one piece of an affiliate marketing “swipe file” puzzle. Ultimately, it’s “copy and paste” copy that makes promoting your offer dummy proof for your affiliates. The problem with it, however, is it’s often misused by those who want to lend a helping hand in sharing your product or service with their audience. I say that because of the “copy and paste” nature of it. You make it crazy simple for them to drag and drop your ready-made materials into their email system, social media platform textboxes, and more. And, while that’s one of your goals—to make their lives easier—encouraging them to use this shortcut without much guidance will cause all that time and energy you put into creating swipe copy to crumble into a million pieces. Well, think of it this way. If every single one of your promoters sends out the same exact messaging—word for word—you can bet that’ll be not only super unoriginal, but also ineffective for your business and theirs. How can I write swipe copy in a way that’ll benefit my business & my affiliates? Thanks to the help of Matt McWilliams—an affiliate/JV manager, consultant, and online entrepreneur—I’ve got just the tips you need to do it the right way. 1. Include only need-to-know information. Think about all the critical details you include in your typical sales materials—your story and solution, a strong list of features and benefits, a thoughtful bonus, guarantee, social proof, urgency and/or scarcity, and a clear call to action to name a few. The components for the swipe copy of your affiliate marketing efforts shouldn’t be any different. You know, only the need-to-know info. That should make it a bit easier for you, right? Absolutely. No matter what, as soon as you’re ready to sit down and write, just be sure you step into the shoes of your affiliate’s audience(s) to avoid making it all about you and your offer. 2. Step away from the one-size-fits-all mentality. While you may be writing with a particular audience (or audiences) in mind, remember that each group has different needs, headaches; all that good stuff. So, step away from the one-size-fits-all mentality. To do that, however, it may require you to actually write different versions of swipe copy for various stages of the promotion (ex. Pre-launch, cart opens, day before cart closes, and cart closing day). Yes, that will take some extra time on your end. But, it’ll do nothing but help you as you’ll ensure your messaging speaks directly to each audience and gets you those coveted conversions. Another side of this tip is to keep in mind the different platforms your affiliates use for their marketing and advertising initiatives. Chances are, you’ll need to write different lengths of copy for different platforms—email, sales pages, social media, and so on. This only requires you to condense your original message (from, say, your sales page swipe copy) to allow your supporters the opportunity to effectively communicate your offer across their social media accounts as well. 3. Make it clear that your swipe copy is only a guide. As I touched on earlier, swipe copy is easy for your affiliates to misuse because it requires little to no effort on their end to copy and paste what you’re giving them into the online mediums of their choice. As a result, every single one of your promoters sends out the same exact messaging—word for word. And, your new product or service launch suffers because the messaging has become monotonous and stale. I don’t want that for you. Therefore, to keep that from happening, make it clear that your swipe copy is only a guide. Your affiliates should think of it as a file of talking points, and inject their personality and flair into it so it’s specific to their tone of voice and audience. Also, don’t be afraid to repeat the fact that it’s a guide over and over and over again. Your affiliates might get sick and tired of hearing it. But, you’re laying the groundwork so you can help them help you. 4. Consider hiring someone or using a tool to write it for you. That said, consider hiring a professional copywriter—aka an outsider—who can easily relate to your affiliates. Or, look into using a tool that can write it all for you! We’ve got a few awesome scripts that’ll help you get the job done. Our JV Sales Letter Invite script will craft all the information your affiliates need to know with one click of a button. You can pop this link into a one-off email to those in your niche industry and even industry search forums. And, if you already have an existing affiliate email list to work with, you’ll want to check out our JV Invite Email Sequence. It pairs nicely with the sales letter invite, and is designed to get people to your affiliate page and boost their excitement levels regarding your upcoming product or service launch. So, there you have it. I’ve given you the not-so-secret secrets to writing swipe copy that’ll benefit you and your affiliates! Talk about a win-win. When implementing these tips into your copywriting process, you’ll give your supporters some inspiration to properly promote your product or service. Best of all, you’ll provide your upcoming launch the momentum it needs to help you win BIG! To get it in your inbox right away, just enter your email address in the box on the right side of the screen, and it’s yours! Have you written swipe copy for your affiliate program before? Let me know any additional tips you may have to share in the comments section below. I’d love to hear from you!